1. 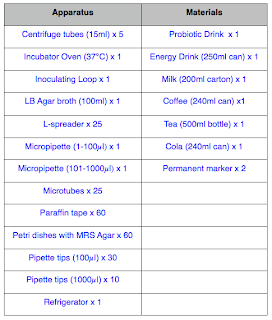 Collect and assemble beverages, and put them into 15ml laboratory centrifuge tubes. 2. Use a 10µl inoculating loop, dip it onto the probiotic drink, and perform a the quadrant streak method on a MRS Agar (the Man, Rogosa and Sharpes Agar) to inoculate it. Incubate it for 2 days. This step is to grow lactobacillus colonies to separate the lactobacillus from the probiotic drink. 3. Use a 10µl inoculating loop to collect 3 colonies of lactobacillus from the petri dish and put it into a micro-tube with 1ml of sterilized water. This is to convert the Lactobacillus into solution form so that we can put it together with the other testing samples(beverages) in the later stages of the experiment. 4. Use a micropipette and collect 20µl of the lactobacillus solution from the micro-tube from step 3 and drop it in 7 micro-tubes each together with 1ml of different samples tested. 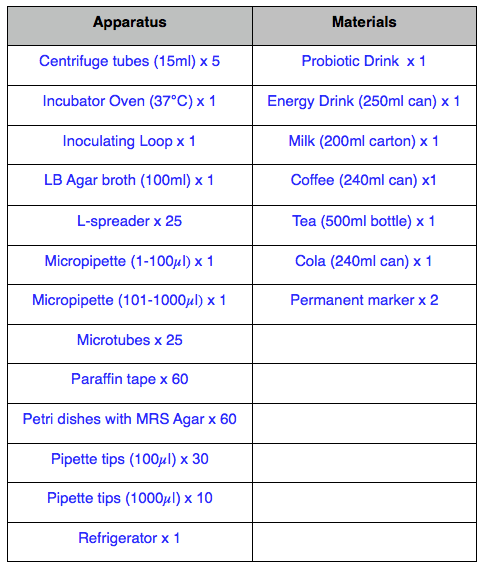 (Cola, Energy Drink, Milk, Coffee, Tea, LB Broth, Sterilized Water). Incubate the micro-tubes for a day. This step is to put the lactobacillus solution into the beverages to allow the lactobacillus to grow in the beverages and later, see the growth of the lactobacillus for each beverage. Freeze the micro-tube from step 3 to prevent further growth of the lactobacillus, if needed in the future. 5. Use a micropipette and collect 30µl of the solution of a micro-tube from step 4 and drip it onto a MRS plate. Then, spread the inoculum evenly using L Spreaders. Label the plate and tape it. This is to test the lactobacillus growth while in the various beverages in the micro-tubes. 6. Do step 5 three times for each beverage. Doing this would increase the accuracy. Finally, incubate the plates for 2 days. 7. Count the bacteria in each petri dish using a colony counter and record it down. 9. 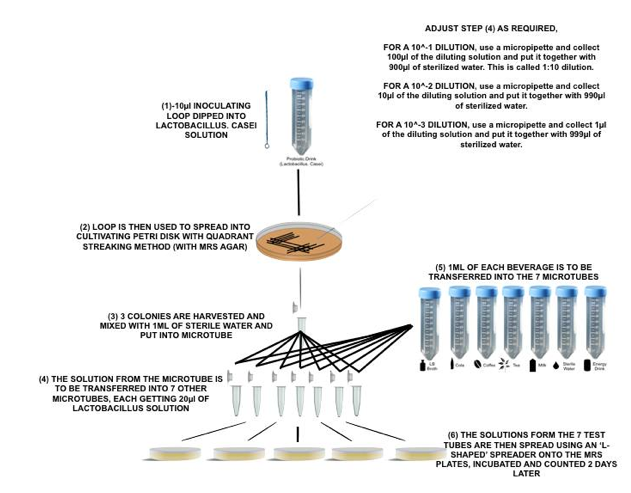 Repeat step 4-7 using the micro-tubes with the 100, 1000 and 10,000 solution dilutions. 1. Loosen the centrifuge tube caps. 7. Do not touch the previously streaked areas. Use a micropipette and collect 100µl of the diluting solution and put it together with 900µl of sterilized water. This is called 1:10 dilution. Use a micropipette and collect 10µl of the diluting solution and put it together with 990µl of sterilized water. This is called 1:100 dilution. Hence, to get 100, dilution, we would just apply the 1:100 dilution technique to the original solution. To get 1000, dilution, we would just apply the 1:10 dilution technique to the one is to hundred solution. The laboratory risks faced in the research can be divided into three types of hazards to human safety, chemical hazards, biological hazards and physical hazards. 1. Physical contact with cleaning agents (hand sanitizer): Prevent or discourage the touching of sensitive external organs of the human body, whether or not your hands are cleaned. Hand sanitizers may be helpful in keeping our hands clean but they tend to have certain effects like irritation when contact is made with certain parts of the body, especially the eyes. This is as stated in the prescription of the hand sanitizer. If your eyes comes in contact with these cleaning agents (hand sanitizers), rinse it with water immediately to minimize effect. 2. Ingestion of cleaning agents (hand sanitizer): Forbid any form of consumption in the laboratory even with clean hands from hand sanitizers as the contents in the hand sanitizers are usually not edible. This is as stated in the prescription of the hand sanitizer. If you had accidentally taken in the contents of the hand sanitizer, please seek medical attention immediately. 3. Fire from flammable agents (hand sanitizer): Keep flammable agents or objects like the hand sanitizer far from fire sources or other hazards to avoid accidental fires in the laboratory. This is because most hand sanitizers are flammable due to the base substance being a very flammable substance, Ethanol. This is as stated in the prescription of the hand sanitizer. Also, never keep volatile solvents, such as ether, acetone, or benzene in an open beaker or Erlenmeyer flask. These vapors can and will creep along the bench, ignite, and flash back if they reach a flame or spark. 4. Potential exposures to growth mediums (LB and MRS agars): Prohibit any kind of contact with biological substances used in the experiment (the agar growth mediums). This includes ingestion, inhalation and physical contact of these biological substances. This is because any form of organic biological material poses a biohazard level 1. Additionally, wear proper gear like gloves and wash hands when needed to keep ours selves disinfected. 5. Potential exposures to bacterial media (L.casei): Disallow any kind of contact with biological substances used in the experiment (the bacterial media, L.casei). This includes any form of ingestion, inhalation and physical contact of these biological substances. This is because any type of organic biological material are poses a biohazard level 1. Additionally, wear proper gear like gloves and wash hands when needed to keep ours selves disinfected. 6. Consumption of biologically contaminated food items: Stop or discourage eating or drinking in the laboratory. Also,wash your hands before handling anything which goes into your mouth both inside and outside the laboratory. Besides, use the water fountains for a drink and not a laboratory faucet, but remember to wash your hands before using the water fountain or bathroom. In addition, never use chemicals like edible salts, sugars, alcohol, bicarbonates from the laboratory or stockroom as a food source as they might be contaminated or mislabeled. Likewise, never use laboratory glassware as a food or drinks container. Additionally, never store food or drinks in a laboratory refrigerator or even consume ice from a laboratory ice machine. This is because all of test subjects or objects used in the laboratory as laboratory work is not fit for human consumption having a level 1 biohazard. 7. Slips and falls from working in wet locations (sink area): Constantly keep wet locations or areas cleans by preventing the accumulation of water or constant maintenance at that particular area. This will keep the certain area dry to minimize slips, ultimately falls and follow on accidents. 8. Incisions from damaged lab apparatus (petri dish, etc): Display better usage of lab apparatus so as to not damage them and be careful when checking the lab apparatus before hand for errors on the physical structure of the lab equipment, whether they are damaged or not. This reduces the risk of having minor cuts on the user. There are some general safety precautions in the laboratory. The major ones are as below. 2. No eating or drinking in the laboratory. 3. Never enter a laboratory without a higher authorities’ permission and a teacher or skilled personnel should always be present for supervision. 4. Wash hands constantly before and after experiments, or in intervals. 5. Always follow strictly the instructions given by the teacher when doing practical work. 6. Avoid physical contact with chemicals or biological substances, always use a glove or a tool to do so. 7. Avoid direct inhalation of chemicals or biological substances. 8. Report all accidents and breakage to the teacher or skilled personnel. 9. Be careful in handling flammable liquids or substances. 10. Request apparatus needed from the personnel or teacher and never take it on own accord. Use a marker and dot each bacteria colony to show that the colony is counted. Another person will click the button and increase the count the bacteria while the first person counts the bacteria.